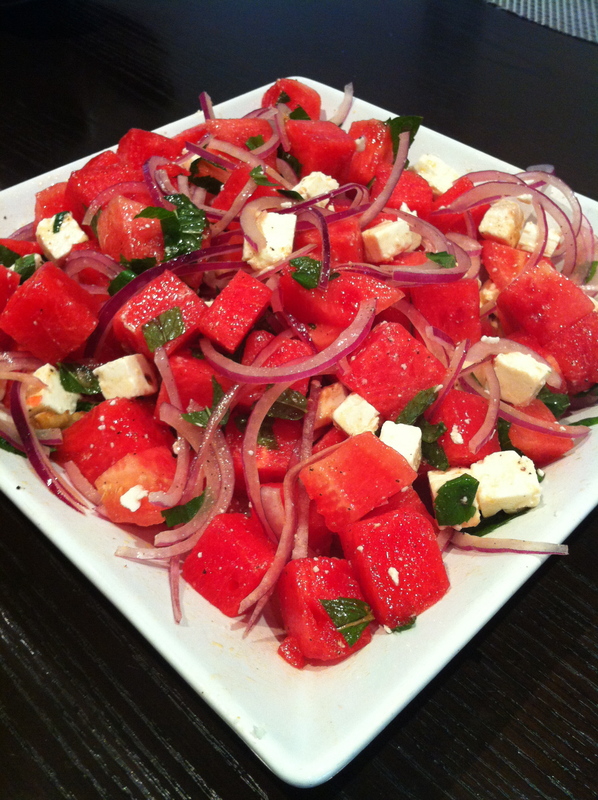 In the last few years I’ve noticed that watermelon and feta salads have been popping up on restaurant menus and at foodie dinner parties. Many are intrigued by this unique and unusual combination of flavours. 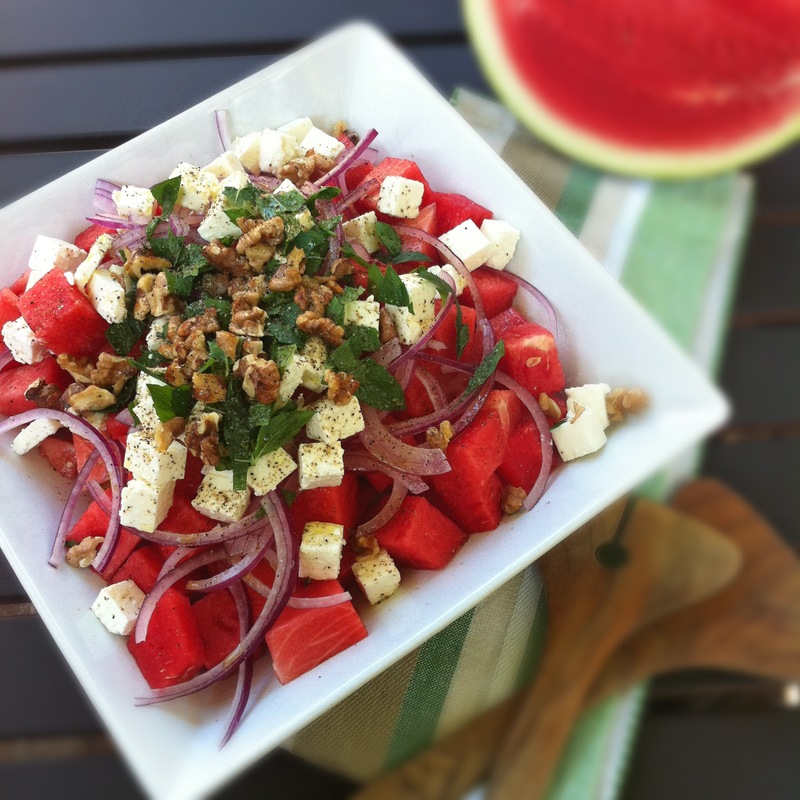 For me, there is nothing unusual about pairing feta with watermelon……I’ve been eating them together since I was a toddler! While most of my Canadian friends were eating pancakes and waffles for weekend breakfast, my typical weekend fare was toasted Persian barbarry bread, feta cheese, some sort of accompaniment and a cup of Persian tea. The accompaniment varied… sometimes we ate our bread and feta with dates (my favourite), mint and walnuts, jam (my favourite was Persian carrot jam) or fresh watermelon. When I was young, my brother and I would tear a piece of barbarry, put a little chunk of feta and our favourite topping on it, dip it in our tea and pop it in our mouths. This is still one of my favourite breakfasts ever……although I now refrain from actually dipping it in my tea. 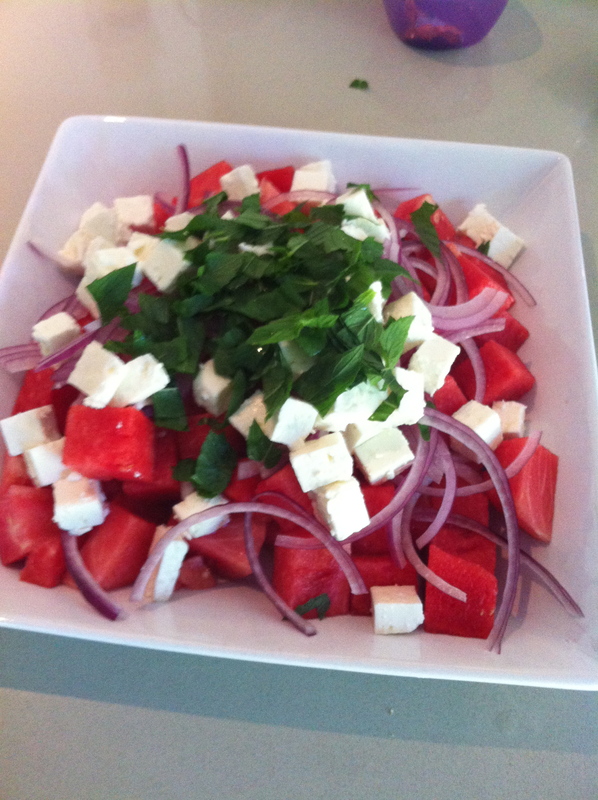 This is my version of a watermelon and feta salad. 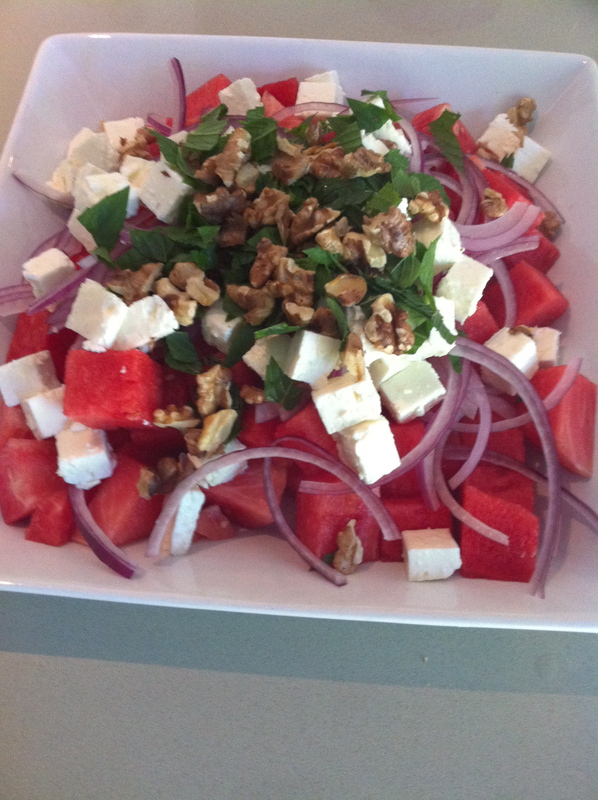 I love the combination of the sweet watermelon with the salty and creamy feta, refreshing mint and toasted walnuts. Make sure that you buy good feta. I prefer a sheep or goat milk Greek or Bulgarian feta. 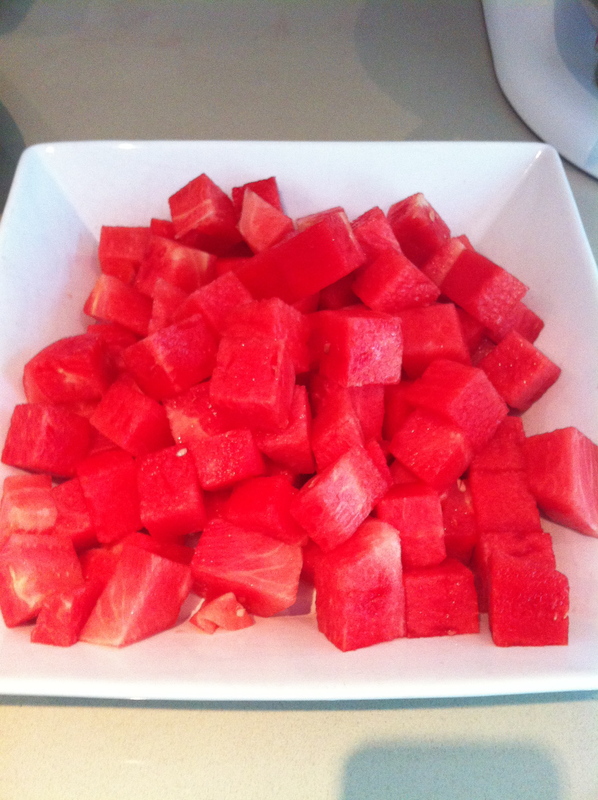 Put the watermelon in a large bowl. Add the red onion, feta and mint. Sprinkle with the toasted walnuts. Pour the olive oil and lemon juice over the salad. Sprinkle on 1/4 tsp of salt and 1/4 tsp of fresh ground pepper. Toss and serve. Enjoy! *To toast the walnuts. Place them in a small frying pan over medium high heat. Stir often for about 3-4 minutes or until they start to get fragrant and slightly toasted. This entry was posted in Appetizers, Gluten-free, Persian Inspired, Salad, side dish, Vegetarian and tagged iranian food, iranian food blog, iranian recipes, persian food, persian food blog, persian recipes, salad recipe, vegetarian recipe, watermelon recipe by thepomegranatediaries. Bookmark the permalink. Great recipe, I’ll make some for a party that I’m attending!